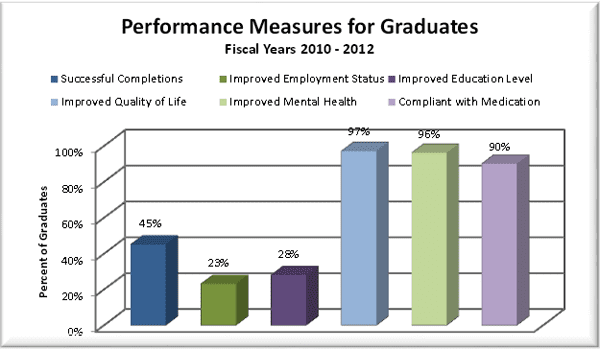 Mental health court participants also enjoyed improved mental health, education, and job outcomes, the survey finds. 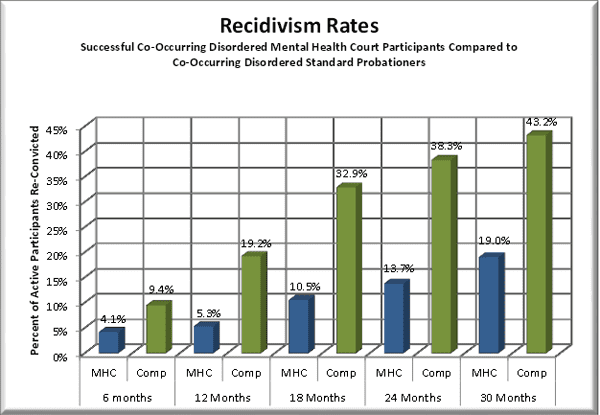 “[T]he results show that mental health courts have reduced recidivism, improved medication compliance, improved quality of life, and assisted participants in averaging over 300 days of continuous sobriety prior to graduation,” the SCAO report states. “The central premise of mental health courts is that, by addressing the offender’s mental health issues, we can prevent future crimes and also help the offender become a contributing member of society,” Schmucker explained. Offenders who participate in mental health courts have serious and persistent mental illness, such as schizophrenia, bipolar disorder, psychosis, or severe depression. The programs include treatment and therapy, drug testing, help with enrolling in classes and certificate programs, and assistance with pursuing a job, with close supervision by a judge, Schmucker said. ~Almost all mental health court participants graduated with improved mental health and better quality of life. ~Of participants charged with felonies, 39 percent improved their employment status – starting a job or working more hours – while in the program. An additional 18 percent of misdemeanor participants improved their employment status. ~A significant percentage of participants improved their education level – for example, by taking courses toward a GED – while in mental health court. Misdemeanor and felony participants were most likely to improve their education level, at 29 percent and 27 percent respectively. ~Over 90 percent of successful participants were taking their medications upon graduation. ~Graduates of mental health courts averaged over 300 days of continuous sobriety before graduation. The report, which covers October 2009 through September 2012, is online at http://www.courts.mi.gov/Administration/SCAO/OfficesPrograms/Documents/SpecialtyCourts/ MMHCGP -ProcessEval2012.pdf. Counties with mental health courts include Allegan, Berrien, Cheboygan/Presque Isle, Genesee (adult and juvenile), Grand Traverse (adult and juvenile), Jackson, Kalamazoo, Livingston, Montcalm, Muskegon, Oakland, Saginaw, St. Clair, and Wayne.